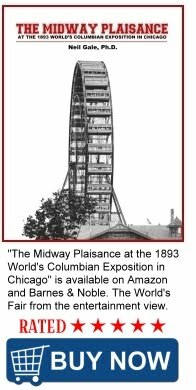 The Digital Research Library of Illinois History Journal™: About Clarence Buckingham and his Memorial Fountain in Chicago's Grant Park. 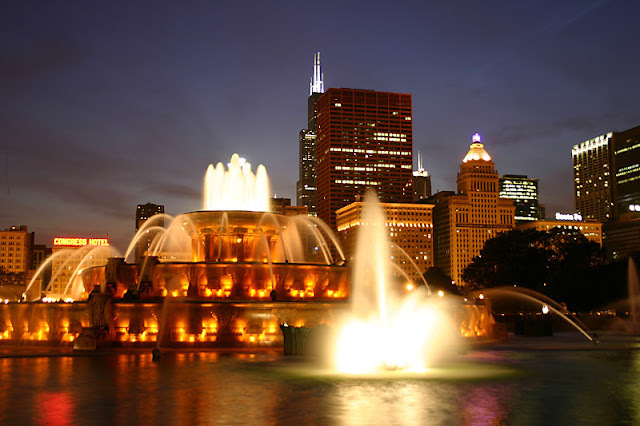 About Clarence Buckingham and his Memorial Fountain in Chicago's Grant Park. The family’s North side home was destroyed in the Great Chicago Fire in 1871, and in 1875 they moved into their new home at 2036 S. Prairie Avenue. The new residence housed a valuable collection of art which in time became one of the finest private collections in the city. An article in the Chicago Tribune dated May 6, 1883 entitled “Some of the Notable Pictures in the Collection of Mr. E. Buckingham, of This City” described in detail a number of the works, many of which were watercolors. The Buckinghams instilled a love and appreciation of art upon their three children, which would have a profound effect upon those children later in life. The lasting legacy of Clarence Buckingham, of course, is the fountain that bears his name in Grant Park. Officially called the “Clarence Buckingham Memorial Fountain,” the project was announced in January 1924, when the South Park board of commissioners voted to accept the gift, donated to the city by Kate Sturges Buckingham in memory of her brother, Clarence Buckingham, and was thus constructed at a cost of $450,000. Kate Buckingham also established the Buckingham Fountain Endowment Fund with an initial investment of $300,000 to pay for a maintenance fund, for a total cost of $750,000. The design of the fountain, twice the size of that of Latona at Versailles. Architect Edward H. Bennett of the firm Bennett, Parsons and Frost, designed the fountain and French artist Marcel Loyau produced the sculptural elements. Work commenced in August 1925 and would take two years to complete. The fountain was officially dedicated on August 26, 1927. An estimated 50,000 people attended the ceremonies and watched the inaugural performance of the fountain’s water jets and colored lights, set to a live performance of the “Stars and Stripes Forever” performed by John Philip Sousa’s band. It is one of the largest fountains in the world. Built in a Rocky rococo wedding cake style and inspired by the Latona Fountain at the Palace of Versailles, it is meant to allegorically represent Lake Michigan. It operates from April to October, with regular water shows and evening color-light shows. During the winter, the fountain is decorated with festival lights. Many tourists and Chicagoans visit the fountain each year. The fountain operates daily from mid-April through mid-October with the last show beginning at 10:00 pm. Water shows occur every hour on-the-hour and last 20 minutes. During shows, the center jet shoots up vertically to 150 feet, and night shows are choreographed with lights and music. The fountain is constructed of Georgia pink marble and contains 1,500,000 U.S. gallons of water. During a display, more than 14,000 U.S. gallons per minute are pushed through its 193 jets. The bottom pool of the fountain is 280 ft in diameter, the lower basin is 103 ft, the middle basin is 60 ft and the upper basin is 24 ft. The lip of the upper basin is 25 ft above the water in the lower basin. The fountain's pumps are controlled by a Honeywell computer which was previously located in Atlanta, Georgia until the 1994 renovation when it was moved to the pump house at the fountain. The fountain's security system is monitored from Arlington Heights, a Chicago suburb. In 1994, the fountain received a $2.8 million restoration to its three smallest basins which developed leaks due to Chicago's harsh winters. 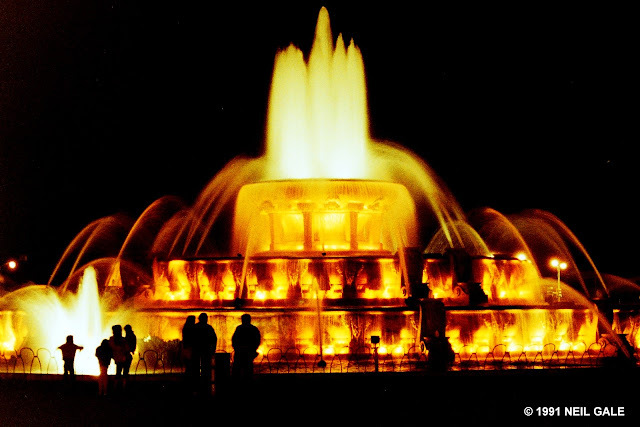 The latest renovation project on Buckingham Fountain began in September 2008. This three-phase project modernize aging internal systems in the fountain and restored deteriorated features. Funding came from a combination of the Buckingham endowment, city and park district funds and a grant from the Lollapalooza music festival which is held annually near the fountain. Phase I was dedicated April 3, 2009. This phase included permeable pavers to surround the fountain. This replaced the crushed stone that was used since the fountain was constructed. The pavers make a safer and smoother surface and complies with the Americans with Disabilities Act of 1990. Phase II began in the winter of 2009. This phase included the demolition of the fountain table, installation of extensive underdrainage system, new landscaping, site lighting, signs, site furnishings, sewer system, selective demolition within or adjacent to the fountain's outer basin, repairs of some existing cast-in-place concrete elements and installation of new cast-in-place elements. Phase III includes the restoration of Buckingham Fountain and fountain table, the construction of a new equipment room with selective demolition, structural construction and repair, masonry restoration and repair, mechanical and electrical work, bronze restoration and repair and installation of site improvements and amenities. Buckingham Fountain is often mistaken for the eastern terminus of U.S. Route 66, but in fact it is not. The original eastern terminus was at the intersection of Jackson Boulevard and Michigan Avenue in downtown Chicago in 1926. In a later alignment, the terminus was moved east two blocks to the intersection of Jackson Drive and Lake Shore Drive after the latter was designated as U.S. Route 41. 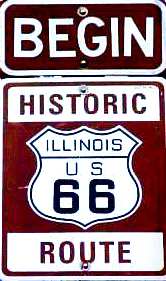 It remained there until the eastern terminus of Interstate 55 was completed at Lake Shore Drive, and then that also became the eastern terminus of Route 66 until I-55 completely replaced the route in Illinois and Route 66 was decommissioned. Today, Jackson Boulevard is a one way street heading eastbound, towards Michigan Avenue and Lake Shore Drive. As a result of changing two-way streets to one-way traffic, you can come into Chicago on the original old Route 66, but you have to leave by way of Adams Street (one way westbound). Adams Street begins at the entrance to the Art Institute of Chicago. Nevertheless, many people still associate Buckingham Fountain with the start of Route 66, even though it had not been built yet when the route opened on November 11, 1926 — whereas Lorado Taft's "Fountain of the Great Lakes" in the South Garden of the Art Institute of Chicago, which has been at that intersection since 1913, actually preceded Route 66 by 13 years and Buckingham Fountain by 14 years. Bravo! Thanks for sharing your knowledge Dr. Neil. I was unaware of the story behind the Buckingham Fountain. I love the history of Chicago even though I am not a native Chicagoan.